I am a minimalist when it comes to furniture. I do not like big bulky pieces that take over a room. This hall table we've had in the house since I met my wife. Her mother purchased it while she was teaching in Qatar. What I like most about it, is that it was built by some guy on a street corner. That's right, hand crafted. When my wife's mother came back, she had the piece transported along with her other things where it has been sitting in one room or another ever since. The whole piece is made of real wood. Usually particle board or some other cheaper material is used for parts that will not be seen. Not this piece. Then again, their really is not much about it that isn't seen, so I guess it would stand to reason. The legs have a nice gradual taper giving them an ease to the sight line. The drawers are essentially suspended on wooden runners that have been coated with wax for a smooth operation. 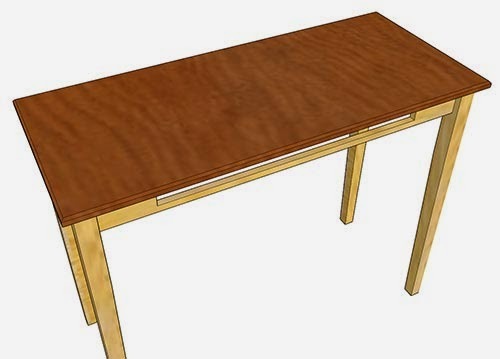 The drawer fronts and the table top have a no frills chamfer around all sides. It's design is simple and straight forward yet has enough infused elegance to suggest it is ready for any room in the house. 1.5" = 1x2's .125" = 1/8"
2.5" = 1x3's .375" = 3/8"
3.5" = 1x4's .625" = 5/8"
5.5" = 1x6's .875" = 7/8"
4 - Table Legs @ 36" x 2" x 2"
2 - Side aprons @ 15.25" x 3.5"
2 - Front and Back aprons @ 42.5" x 3.5"
3 - Drawer glides @ 15" x .875" (7/8") x 1.5"
1 - Hall Table Top @ 48" x 21"
2 - Drawer bottoms @ 13.625" x 14"
4 - Drawer sides @ 15" x 2.5"
4 - Drawer sides @ 13.125" (1/8") x 2.5"
2 - Drawer face fronts @ 15.375" x 3.5"
Cut legs to length. Mark the two insides of all the legs. Lay out for the two dadoes by measuring 1/2" from the inside corner. Then 3.5" down. The taper for the legs begins at 10" down from the top. Mark the bottom of each leg 1/2" in on all the insides that we marked earlier. The taper is cut on the same sides as the dadoes only. The bottom of the legs should taper to a final measurement of 1.5" x 1.5". 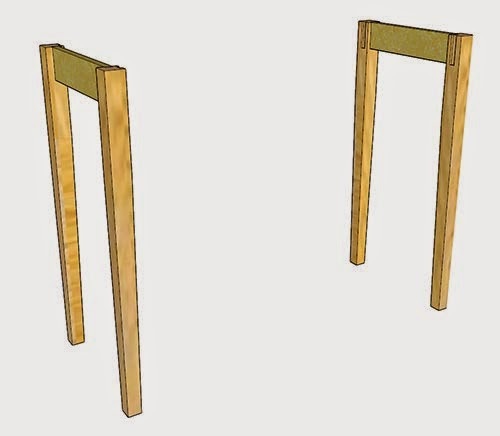 TIP: Looking for an easy way to cut the taper in the legs? Try this!! Once all the legs are shaped, cut to length the side aprons. Then glue and clamp the side assemblies together. Cut the front and back aprons to length. Measure 6" in from both sides on the front apron. Then 3/4" up from the bottom. 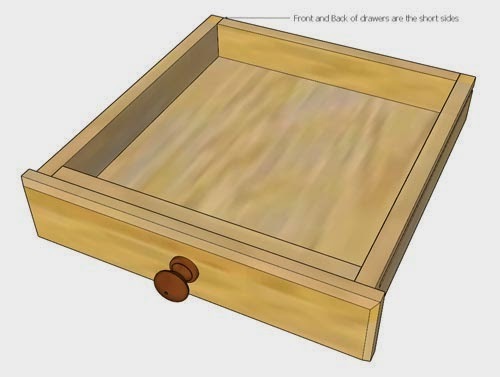 Mark the waste side and remove the section of the apron for the two drawers. Glue and clamp the front and back aprons to the side assemblies. 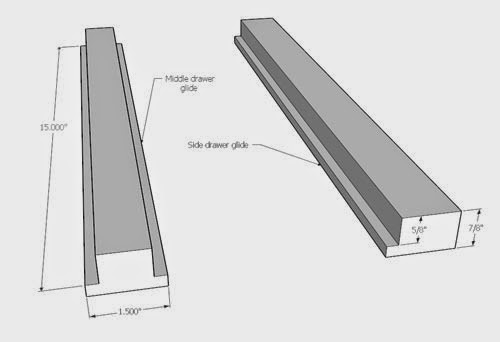 Cut the three drawer glides to length. Then route the dadoes. Use caution when routing dadoes in such small pieces. 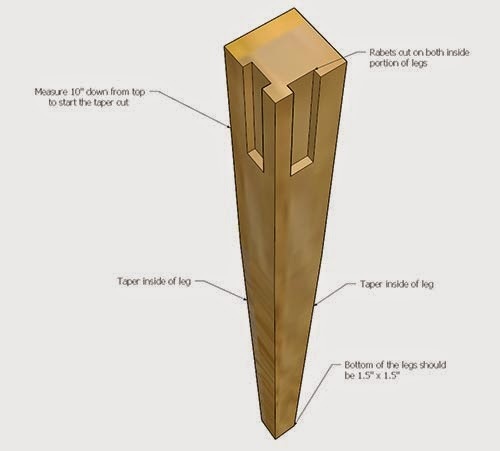 TIP: Finding it hard to locate a piece of lumber that is 7/8"? Rip a 2x4 to those odd thicknesses. Cut the table top to size and attach to the base. Flip the top upside down. Then flip the base upside down. 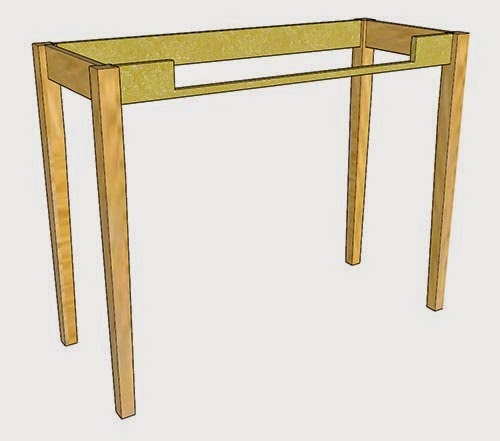 Position the base on the top as desired and attach with pocket hole screws. 6 - 1x4's make 21". Or use plywood and edge band the sides of the top. While the top and base are upside down, now would be a good time to attach the drawer glides. 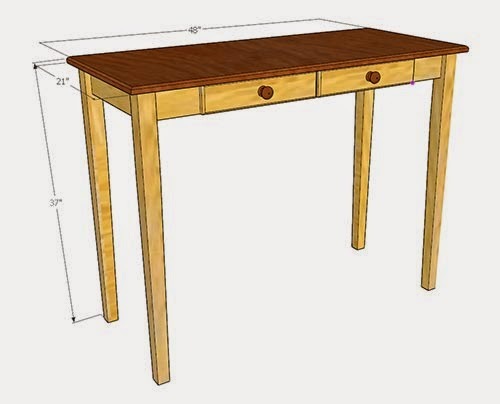 Cut all the pieces for the drawers. Cut the dado 1/4" up from the bottom on all four sides. 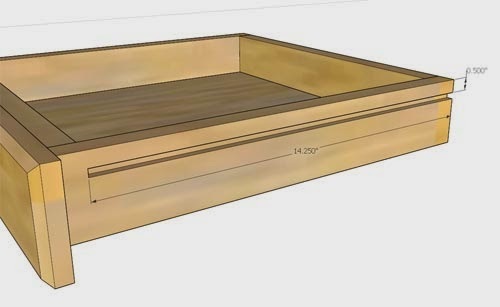 Before assembling the pieces, flip the two side pieces of each drawer over and cut another 1/4" dado for the drawer glides. Then assemble the drawers and attach the face fronts. 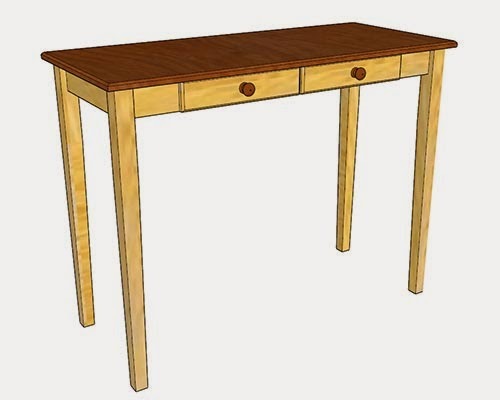 Pieces like this are sometimes referred to as a "sofa console table". That is because they are often times the same height as the back of a couch. The table can be placed behind a couch if you have one that is positioned in the middle of a room and has its back exposed. Lamps and other decorative pieces can be placed to complete a room decor. You may want to measure the height of the back of your couch and adjust the listed measurements accordingly if you think you may want to imploy such a design in your home. Nice table. 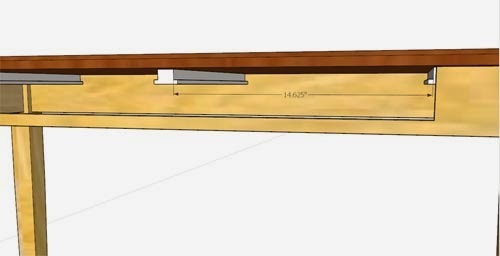 Question about the dado position. It says "Cut the dado 1/4" up from the bottom on all four sides." Should that be ½" down from the top of the drawer sides? Not unless you only want a 1/2" deep drawer. The quote you gave me was for the dado for the drawer bottoms. Not the one for the drawer glides.